Local Locksmith In Leeds, Not A National Company! Fed up of Searching For A local locksmith in Leeds? Do you keep coming across national locksmith company’s trying to trick you into thinking they live in Leeds? Luckily you are now in the right place. I’m Ben and I own and manage 1st Defence Locksmiths Leeds. Let me tell you a bit about us. 1st Defence Locksmiths Leeds are a well established family run Leeds locksmith company based in Leeds and we have over 10 years experience in the industry, making us one of the most experienced locksmiths in Leeds. We serve both domestic and commercial customers in Leeds and the surrounding areas. 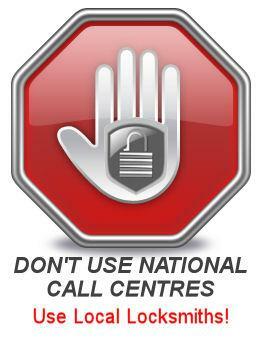 We are completely independent locksmiths and we do not work for national locksmiths or call centres. At 1st Defence Locksmiths Leeds we never charge a call out fee even at evenings and weekends. We also do not charge VAT which saves you 20% against some company's straight away. No Call out fee coupled with no VAT makes us one of the best value locksmiths in Leeds and helps to keep our locksmith prices low. We are also now proud members of checkatrade. Want to see our Checkatrade reviews? Visit the link below to see our profile and our amazing reviews. Customer satisfaction is always top of our list and as a result we aim to get to all emergency jobs in Leeds within 1 hour of your call where possible. We have a vast range of materials in stock so most of the time we can complete the job on the first visit to your home or business property. If on the rare occasion we don't have the correct part with us we can usually source most items the same day. As well as attending emergency call outs we also carry out non emergency pre planned bookings. We can book pre planned work for a time which is convenient for you even if this means visiting your property on an evening or weekend. Due to our vast experience, when you call we can usually give you a fixed quote over the phone. However for more complex jobs we might need to visit your property to give you an exact price. If we do need to visit your property in order to give you a quote we never charge for this service. Once the price is agreed we will carry out the work to the highest standard possible and all parts supplied and fitted by us come with a full 12 month guarantee. At 1st Defence Locksmiths Leeds we are fully insured and also fully DBS checked for your piece of mind. Please feel free to check our insurance status at the bottom of this page. A crime wave is sweeping across Leeds and West Yorkshire where standard locks on Upvc doors are being snapped and burglars are gaining entry to homes in seconds. We can supply and fit anti snap locks to combat this type of break in technique and we have various different brands offering different levels of lock snapping protection so you can be sure we will have a lock to suit everybody's budget and security needs. Please note we do not use cheap Chinese copy's of anti snap locks like some other company's have been known to do! We only use top quality genuine and proven brands. Our top of the range Brisant Ultion anti snap lock comes with a £1000 guarantee against lock snapping! Take a look at our anti snap lock page for more detailed information. At 1st Defence Locksmiths Leeds we are experts in Upvc door lock installations and repairs. We can supply and fit all makes and models of Upvc door multi point locks. We offer a full Upvc door lock service including opening jammed or faulty multi point locks, re aligning doors and frames, replacement gearboxes, replacement multi point locks and repairs where possible. For more information please visit our Upvc door locks page. Aluminium Door Repairs. Old domestic aluminium doors? Problem with commercial shop front? We also carry out an extensive aluminium door service across Leeds and West Yorkshire. We Supply and fit all types of locks for aluminium doors and also other essential items such as door closer's and door alignments. You can find more detailed info at our aluminium door repairs page. Thefts from vans is becoming an increasing issue for owners. Quite simply many of the manufacturer fitted van security systems are just not up to the job of keeping the van secure. To combat this we can supply and fit Thatcham approved van door deadlocks and euro cylinders to strengthen the existing vehicles security. We have an option for just about every single make and model of van available at the moment. For more information please visit our van door locks page. We don't just do locks here at 1st Defence Locksmiths Leeds we also undertake all aspects of alarm work as well. Whether its a commercial or domestic property we have an alarm solution for you. From basic traditional style burglar alarm systems to a high tech super modern solution we can do it all. Please visit our burglar alarms page for a more detailed insight into our services. When you call you will speak directly to our skilled Leeds locksmith not just somebody in a call centre that has no knowledge of locks at all, no matter what time of day or night you call. Whether its a simple lock change or a complex master key suit 1st Defence locksmiths Leeds can be of assistance. We also offer discounts to student and old age pensioner discounts. Please do not hesitate to contact us using any of the phone numbers at the top of this page. Please click the link for a complete list of our locksmiths Leeds services. Please do not hesitate to give us a call to discuss your locksmith needs. Below are just some of the external websites we are also listed on, please feel free to visit our Leeds reviews page to read more of our excellent reviews. Visit our Google Local page to read some of our awesome reviews. We've decided to keep you up to date with what we get up to on a weekly basis here at 1st Defence Locksmiths Leeds. Don't worry we will try not to bore you too much! We will update this page from time to time when we come across anything interesting to share with our customers in Leeds. Best 3 Locksmiths In Leeds Again! 1st Defence Locksmiths Leeds are so proud to announce that once again we have been voted one of the top 3 locksmiths in Leeds, for the second year in a row! We also managed to achieve being in the top 3 locksmiths in Leeds in 2017 and now again in 2018. As a small local Leeds based locksmith company this means the world to us. We always try and go above and beyond for our customers and try to deliver the best locksmith service in the Leeds area. Its so nice when other recognise the efforts you are putting in on a daily basis. The three best rated website looks at 50 different points of the company's online presence to determine which 3 locksmith business's come out on top. You can be sure we will also be aiming to achieve this again in 2019. At 1st Defence Locksmiths Leeds we recently introduced a service, supplying and fitting deadlocks to vans. In the short time we have been securing vans in and around Leeds we have had a huge number of requests for this type of locksmith service. Our latest one was to supply and fit Thatcham approved deadlocks to the rear and side loading doors of a Volkswagen Transporter Highline. These locks are an additional extra to the manufactures locking system and offer a very robust solution to the van break in epidemic which has occurred over the last couple of years. All our kits are tailored to each van ensuring the best possible fit with maximum effectiveness against theft from vans. For this particular job we fitted a hooked deadlock case to the side loading door and a deadbolt case to the rear loading door. Both deadlocks were fitted with a high security dimple lock cylinder. We also keyed alike both euro cylinders meaning the customer only needs one key to unlock both the rear and the side doors, making them much more convenient to use. We, have added some pictures of the work done below. Here at 1st Defence Locksmiths Leeds we hit a huge milestone this week. We received a certificate from checkatrade for reaching 100 reviews on there website. We are over the moon with this and would like to thank all of our customers in Leeds for your business and support by taking the time out of your busy day to leave us the reviews. We work tirelessly to get the best feedback scores from our customers and we are proud to have a current score at the time of writing of 9.96 out of 10. 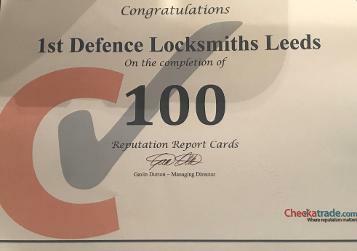 1st Defence locksmiths Leeds have only been a member of checkatrade for the last 18 months so we think we've hit 100 reviews very quickly so hopefully this means we are doing something right! We look forward to hopefully achieving the 200 review certificate in the near future. Thanks again to all our customers, from 1st Defence Locksmiths Leeds. We attended a job last week where the customer was having difficulty with a very modern composite front door. The customer had been struggling with the door for a couple of weeks and had called a company that came up top in the paid adverts on a Google search for "locksmith Leeds". The locksmith company in question had come out and assessed the problem claiming that it was the euro cylinder that was at fault. They changed the euro lock and all seemed to be well for a couple of days until late one Friday night the door seized up in the locked position and wouldn't open. 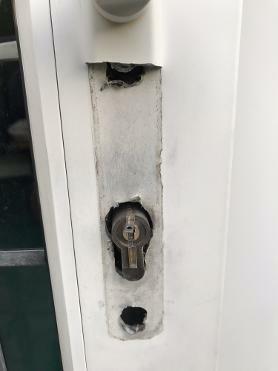 The customer called the locksmith company back who stated it would be £70 for them to come out and take a look even though there so called repair should have technically still been under guarantee. After completely loosing faith in the company the customer called us. We attended on a Friday evening within one hour of the call in the rain to see what the problem was. It turned out the fault was inside the gearbox of the multi point locking mechanism and that the original company had changed completely the wrong part! We quickly opened the faulty door and replaced the gearbox which completely cured the problem. We then noticed there was also a problem with the way the door had been fitted originally about 5 years ago. We also fixed this for the customer while we were there making sure the all parts of the door were working in perfect harmony with each other. The customer was so pleased with the locksmith work we had done on his front door he also instructed us to do further work on the rear door as well whilst we were there and upgrade the security dramatically. All in all a 100% happy customer and he even left us a brilliant review on our Check A Trade page as well. Last week we attended a nursery very local to us in Leeds. 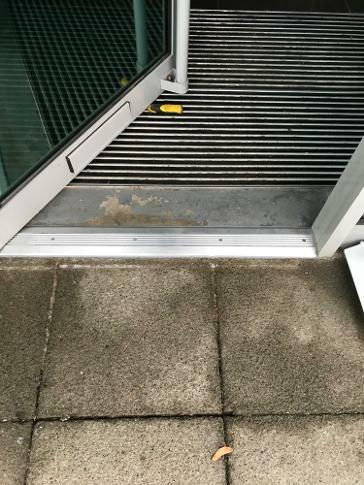 The fault reported was that the front door wasn't closing properly meaning the magnetic door entry system would not engage and hold the door shut properly as it should. Parents were concerned that anybody was able to enter the building without pressing the buzzer. Sometimes in this situation we can just make simple adjustments to the door closer to rectify the problem. On this occasion the 10 year old door closer was not repairable as the oil seals had perished allowing the hydraulic fluid to leak out. The only way to access these types of door closer is to remove the door which is a two man job. On removing the door we also found the bottom pivot to be damaged so we also replaced that as well. Once the relevant parts had been replaced we hung the door and it worked perfectly just as it did when it was originally fitted. We also ran some tests on the electric supply to the magnetic connection and found an intermittent fault with the door release switch inside the building. While we were at it we also replaced the faulty switch and all was left in perfect working order. So now not only does the door operate as it should and close properly it is now secure stopping any unwanted intruders. Another happy customer and also happy parents. One of the things we enjoy the most at 1st Defence Locksmiths Leeds is doing jobs that are a little bit different. Like any job it can get a little bit repetitive doing the same things day in day out. We got called to an old Victorian door at a house in Leeds that had a very outdated locking system. 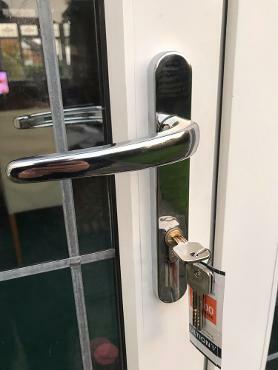 The customer was not convinced that the lock currently fitted was very secure, and also the lock in question was on its last legs and didn't meet the current standard for BS3621. In the unfortunate event of a burglary this would mean any contents insurance could have potentially been voided due to having an incorrect lock type. With the door been so old it was never manufactured with today's locks in mind. The door rail was far too narrow to fit an additional conventional modern type mortise or Yale lock, either up above or lower down from the existing lock. The old lock couldn't be replaced with a BS3621 version of the same lock style as it doesn't exist. After a discussion with the customer they gave us the go ahead to convert the old style lock to a modern British standard sash lock and mortise handles. The job went absolutely perfectly and the door was left looking like the old lock had never even been there. All in all a very satisfying job. We received a rather nice email last week to inform us that we had been chosen as one of the top 3 locksmith company's in Leeds. Website "The Best 3 Rated" has gone through a list of all the locksmiths in Leeds looking at different company websites and external review sites to hand pick 3 best 3 locksmith company's they can find in Leeds, and we are one of them! Business are rated based on a 50 point inspection which includes checking company history, reviews, complaints, satisfaction and business reputation. 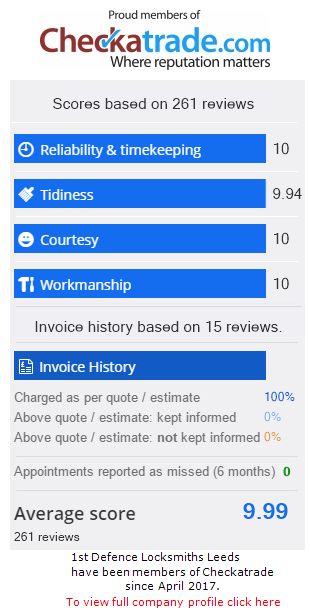 We put so much effort into customer satisfaction and building up great reviews for our locksmith business its nice to get some recognition for our efforts. A big thanks to The Best 3 Rated! We had to help a friend in need recently with a broken Citroen van key. The key had been dropped and had fallen apart. Upon trying to put all the pieces back together the spring mechanism for the flip out key had broken in three places and was no longer operational. At 1st Defence Locksmiths Leeds we do not normally take on auto locksmith work but since all the parts of the key were to hand and the circuit board wasn't damaged we decided to take on the job. We ordered a new empty Citroen key fob shell with an uncut flip out blade attached. We then carefully removed the uncut blade from the flip out mechanism inside the new shell and removed the original blade from the broken key. Then it was time to put the old pre cut blade into the new shell. A very fiddly job but saved the customer the cost of cutting a new blade. Now the key was back to a state where it could be turned in the ignition and vehicle door locks. Also the new button was allowing the blade to flip out and be locked away as it should do. The next stage was to get the circuit board transferred into the new shell as its needed to control the remote central locking and deactivate the vehicle immobiliser. So by delicately removing it from the old shell we popped it into the new one. Finally the last step was to fit a new battery and test all aspects of the key. The key now flips out as it should, opens and locks via the remote central locking, turns in the ignition and door locks and finally turns off the immobiliser and starts the van. A very satisfying job but most importantly 1st Defence Locksmiths Leeds now have another very happy customer. We were called to a multi point locking mechanism problem in Leeds last week. The customer had tried to upgrade the lock cylinders on a pair of French doors but the lock mechanism now had an issue. Once the door had been locked the handle could be pulled down and the door would open when it should have still been in the fully locked position. When we arrived we stripped the lock mechanism from the door to find the back of the gearbox all twisted, bent and part of the cases side split open. After a bit of investigation 1st Defence Locksmiths Leeds found that the customer had replaced the lock cylinder with the new fixing screw supplied. The big problem was that the new fixing screw in question was too long! The screw had punched right thought the back of the gearbox and destroyed the casing and broken some parts inside. This particular mechanism just happens to be the most expensive brand money can buy. Feeling a bit sorry for the customer we decided to try and repair the lock and save the customer some money. At first glance it did appear that the lock was probably damaged beyond repair. By this time it was starting to get dark which obviously always makes a locksmiths working conditions more difficult. All the bent pieces were removed from the gearbox and straightened out using a vice and a couple of pairs of grips. Carefully all the straightened parts were put back in place and the case fixed back together. The bent side of the case was tapped back down and it was fixed ready to test. Upon testing the mechanism it worked perfectly first time! One happy customer and one even happier Leeds locksmith! With over 10 years experience we pride ourselves on this sort of repair, going above and beyond to rectify the problem when most locksmiths would have thrown it in the bin and charged for a whole new unit. All in all a 100% success. We had a very special request recently for a PVC door lock for an elderly customer. The customer couldn't get out of the habit of leaving the key inside the door once it was locked. This meant he was locking out family members and careers. At 1st Defence Locksmiths Leeds we were asked to supply and fit a lock that a key could be still be used on the outside even when there was a key left on the inside. Initially we suggested a type of lock called a Cisa Astral S which comes as standard with a dual clutch mechanism which would allow the double key operation. This particular lock comes with a modern dimple style key and unfortunately wasn't an option the customer was able to use. Because of this we needed to find a cylinder that had the dual action but worked from a tradition type key with a vertical key way. We searched high and low for a lock to meet the customers requirements and ended up contacting 9 different locksmith suppliers to try and hunt down a lock that would meet the criteria. In the end we found a company in London that was willing to build us the lock to the exact specification we needed. The lock was built the same day and shipped to us for next day delivery! We installed the lock at the customers home in Leeds quickly after taking delivery. The customer was over the moon with our solution, price and quick turn turn around time. At 1st Defence Locksmiths Leeds we really do try and go the extra mile and put in that extra little bit of effort to please our customers in Leeds. At 1st Defence Locksmiths Leeds we attended an attempted break in at a Leeds home last week. This was on a secluded property with a very secluded rear garden and patio doors. Unbelievably this was the second time somebody had tried breaking in using the same technique! Fortunately the customer had a Yale one star anti snap lock already installed. This lock is designed to break at a predetermined point and prevent access to the lock mechanism inside the door. The would be intruders had damaged the lock and door handle but the most important hing is they failed to gain entry. Here's a before and after picture of the lock and handle. On the left is the damaged lock after the attempted break in. On the right is a picture of 1st Defence Locksmiths Leeds repair of the lock and door handle. Although the Yale 1 star euro lock had done its job and prevented a burglary the customer didn't want to take any chances and opted for our top of the range Brisant Ultion 3 star diamond standard euro lock. This lock passes every major industry test with flying colours and even comes with a £1000 burglary guarantee against lock snapping. We replaced the damaged old fashioned white handles with a brand new pair of modern shinny chrome handles as well. Along with repairing the damaged and upping the security we also gave the door a modern fresh look with these beautiful looking handles. We attended a property to take a look at a very old and nowadays very rare union 2 lever rebated lock. Two locksmith company's had already been to look at the lock in question but were unable to source a replacement. Due to the massive range of stock we carry in the van we did actually have one of these locks with us, but we advised the customer to upgrade the lock to a British standard 5 lever lock by making some adaptions to the door. Rebated locks are used on double wooden doors and the rebate kit is used to cover the gap in the door when the two doors close together. On the old lock the rebate kit is actually moulded to the lock itself where as the modern way of doing it is to fit a rebate kit over the top of the new lock. Here is a before and after picture of the lock installation. Before is on the left and after is pictured on the right. Its well worth checking that your locks meet current insurance standards or you could find your insurance is void in the event you need to make a claim. 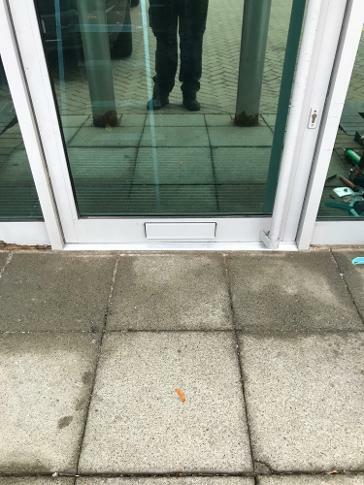 We attended a job at an office park in East Leeds to replace a faulty door closer on a large commercial door. This type of job is fairly routine for us and nothing out of the ordinary. In order to change this particular type of door loser the door must be removed first by lifting it off of a part known as the bottom pivot. Upon removing the door we found something very unusual. 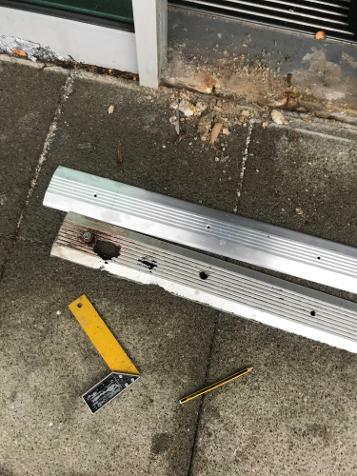 The aluminium door sill was completely rotten right next to the bottom pivot which is a vital piece for holding the door on and ensuring a smooth operation. After a bit of investigation work it turns out that in winter a grit truck pulls into the car park and sprays grit out of the back to cover the car park. Unfortunately this grit had also been going under the bottom of the door and getting trapped in there and over a period of around 10 years had eaten its way through the door sill. The picture below shows the extent of the damage. 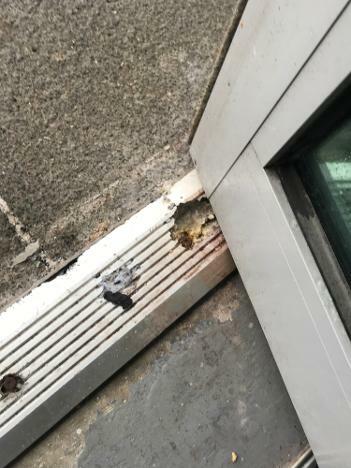 As we were only there to do the door closer we informed the people concerned of the issue who opted for us to change the door closer and order a sill to be fitted asap. We tracked down a door sill that would do the job as theirs literally hundreds of different styles and sizes. We then made a return visit to fit the new sill. Once again the door had to be removed in order to remove the old sill and install the new one. Sills are generally awkward to remove as you usually find all the old screws are rusted in and sometimes they are also sat on a bed of cement. This one was no exception as every single screw was rusted. Once we had got the old one out we cleaned up all the dirt and debris from underneath to ensure a good clean surface to bond the new one too. The new sill was then cut to length and the concrete re drilled for the new fixing plugs. Also a hole was drilled for the new pivot to bolt into. With the sill firmly in place the door was hung again and refixed to the closer which we had previously installed. Next the sill was sealed around all edges using a grey silicone to prevent water seeping underneath or down the sides. The final thing was to test the operation of the two locks already installed on the door to ensure the alignment was perfect after removing a refitting the door. We've attached some pictures below of the finished product. Remember at 1st Defence Locksmiths Leeds we do more than just locks. We offer a complete range of domestic and commercial door repairs as well.